Reading the BHQ on your Ipad or Android tablet? Check us out on the Apple Newsstand and in the Google Play Market! The author of this article is Laura Dempsey. A brief biography of the author can be found at the end of the article. At first blush it seems fitting that military spouses should be included in an issue focused on resilience. The military has spent countless hours and dollars studying and trying to improve the resilience of military families. The government and nonprofits have touted the resilience of our families in a time of protracted war. Nevertheless, this focus on resilience is misplaced. After 10 years at war, military spouse resilience is an oxymoron. Resilience is the ability of an object to return to its original shape after a protracted period of stress or compression. Perhaps this was an appropriate way to think about military families after World War II or Vietnam, when service members left, came home, and returned to their communities. This is not the current state of play. Yet with the changes that have happened in our military families, they are uniquely situated to help our country’s resilience as the economy recovers from over a decade of war. One percent of the U.S. population has carried 100% of the burden of war for 10 years. The average military family has been separated by deployment for between two to three years over the last decade, often with little or no advance notice. For operational branches like infantry and armor units, those years nearly double. This is in addition to an average of four to five permanent moves that each of these families endure during that same period of time. I’m an Army wife of 15 years myself. In those years my husband, our children, and I have moved 9 times. The most notice I’ve ever had about where and when we were going to move is around eight weeks. As a result of these moves, I’ve taken and passed four state bar exams in the first six years of our marriage just to try to sustain my career as an attorney as my husband, an infantry officer, moved around the country and left for various training missions. We’ve now endured three deployments, with the latest wrapping up around the time this article will be published. This cycle of repeated deployment and reintegration on top of the usual mobile military lifestyle has never happened before. It’s easy to see why there is no return to normal for our community. Evidence bears this out. 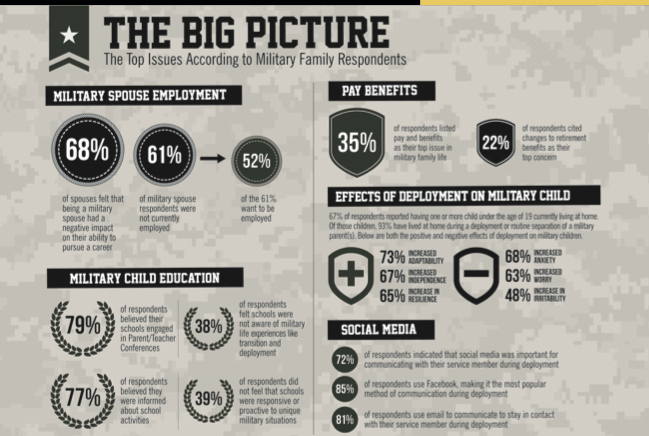 America’s military families have suffered higher rates of divorce, suicide, child neglect, and DUIs. More families are starting to seek mental health services. Meanwhile, military spouse unemployment is at a stagnant 26%. Even in families that are relatively stable, the effects of the last 10 years are more than visible. Traditionally military spouses left their jobs to follow their service member across state and even international boundaries. Spouses were also expected, but not obligated, to donate hours of volunteer time to help fellow young military families. Over the decades, this culture became ingrained, and spouses frequently abandoned their career aspirations to support their communities. This culture has begun to unwind. Many younger families now move back to their hometowns during deployments, and spouses who stay near the military installation become more independent, adding more volunteer hours off the installation and finding work to keep themselves busy and the family more financially stable. More military spouses today are also working than ever before. As this happens, a growing number of families are choosing “voluntary separation” to preserve both spouses’ careers. As families become accustomed to living apart, spouses choose to stay in one place while their service member takes on a new assignment. The effects of these voluntary separations are unknown, but inevitably they will be profound. In short, the effects of these wars are permanent. There is no return to the culture as it once was. Individual lives have been changed forever. There is no such thing as resilience in our modern military families. This is not, however, necessarily bad news. The sea change in military culture has put military spouses in an even better position to help our returning veterans contribute to the recovering economy. America’s resilience will depend on, and ultimately benefit from, all members of our military families. According to the Department of Defense, more than One million service members will be leaving the military over the next five years. There is a national sense of urgency to employ these veterans and prevent them from slipping into financial crisis. While their bravery is unquestioned, many have spent their careers focused on the mission and not on how to market themselves in the economy after they leave. Unemployment is a real possibility, but the outlook for more than 50% of those who are married can be greatly improved if their spouses have stable careers. In theory, most military spouses should have stable careers. They are some of the most employable, desirable job candidates our country has to offer. High mobility, constant unplanned relocation, and an inability to make long-term plans (and sometimes even short-term ones) force military families to develop certain skill sets. Military spouses have always been an independent, social, and highly adaptable group. While our lifestyle makes earning a degree a challenge, more than 85% have a college degree or are working on one. We constantly seek out other military spouses for networking and friendship and use social media at a much higher rate than the general population. At least one-third of military spouses have considered starting or have attempted to start their own business. Moreover, according to the Blue Star Families Military Families Lifestyle Survey, we volunteer at a rate more than three times the national average, often taking leadership roles in both military and community institutions. These characteristics and trends should sound familiar. They have been used to describe the ‘Greatest Generation’ of veterans for years. The American dream has practically become synonymous with World War II veterans returning from war and building their communities, and the country, to greatness. The current narrative surrounding our new generation of veterans frequently borrows from this theme—and it should. Our returning veterans are extremely skilled and seasoned for their age and are more than eager to continue to contribute to society. While they have been on various deployments, their spouses have been living that narrative for the last 10 years. Even as transient members of their communities, they have become some of the most active and generous contributors to both military and civilian society. They too are eager to turn their experiences into a satisfying life for themselves and their families. The impact on our economy is profound and largely unconsidered. With the end of this conflict, America can essentially get a new generation of talent, times two. If we take advantage of the incredible talent and drive of all of our military family members, our country’s resilience from the wars will increase exponentially. At the U.S. Chamber of Commerce Foundation’s Hiring Our Heroes, our military spouse program is poised to help the business community do just that. Conceived, designed, and run by military spouses, the program helps spouses overcome the challenges their highly mobile and chaotic lives pose so that they can become more productive members of their communities. We are partnering with the U.S. Chamber of Commerce’s membership to identify real leaders in military spouse employment. These are companies, large and small, that know the value, skill, and talent that reside as the family partners of our service members. The companies on our Military Spouse Employment Advisory Council—such as La Quinta, USAA, and Capital One—understand the assets they have in their military spouse employees. They are also coming up with innovative ways to identify, track, and hire more spouses. Our purpose is to improve these experiences and share them with the entire business community, under the leadership of the Council and our coalition of the top military spouse nonprofits in the country, the Military Spouse Business Alliance. Real resilience comes from not just surviving challenges, but pushing through and letting those challenges shape future experiences in a positive way. Our military spouses may not ever be the same, but that’s not necessarily a bad thing. We are more uniquely qualified than ever to help the country and the economy surge forward to a place we have not seen. We are a vital part of the new greatest generation and we too can and will make a difference for the better. Laura Dempsey is director of the Military Spouse Employment Program for the Hiring Our Heroes Program at the U.S. Chamber of Commerce. Since joining the Chamber, Dempsey created and now chairs the Military Spouse Business Alliance, a coalition of the top 10 nonprofit subject matter experts in military spouse employment. In addition to her role at the Chamber, Dempsey is co-founder and chairman of Blue Star Families, a national nonprofit network by and for military families. She also serves as a partner in an emeritus capacity at The Marsh Law Firm, pllc located in White Plains, New York.